Last night I went with my brother to the Jazz game. A few of my nephews and one niece also came with us to enjoy the game. We had a blast! They ended up not winning but I thought they played a pretty awesome game. Rachel screamed A LOT but she was fun to hang out with. We got free tickets thanks to the Christmas singalong we attended in December. I'm so glad I went. Hopefully, Adrian will go with us next year when we score free tickets again. I will be selling more of my headbands, baby beanies and flower clips at a boutique this Saturday-Feb 27th. The address is 10834 S Whirlaway Lane, Sandy UT 84092. It is from 11-1:30pm. Come and enjoy all of the fun products that other vendors will be selling. Also, if you would like to enter one of my giveaways, go here, scroll down and you will find it. I am giving away a blue headwrap so be sure to enter. Thanks. Angie Larkin has a gift for creativity. She makes designer jewelry and home decor items. Scentsy was also being purchased at our boutique. Alyssa Colley had some awesome jewelry. And there is our glitter toes gal. I think the boutique was pretty successful. Thank you so much for coming and supporting us and our vendors. I wanted to thank Emily for having the boutique at her home. I think she has a lovely home and it worked out perfectly that she lives a few doors down. It was definitely a full day of fun, shopping, and girl talk. I will be doing more of these in the future so please don't feel bad if you didn't attend this one. You can come to the next one! I may even participate in two this weekend. I'm keep you posted once I know the details. Thanks again! It was a blast. 1st outfit bought by mommy! I did my weekly grocery shopping at Wal-mart on Friday and came across the cutest outfit. Of course I had to buy it. It was on clearance for $11 so it was a deal I couldn't pass up. Plus, it is tradition to go out and buy your baby a gift once you find out if you are having a boy or a girl. Well, that is my tradition! Girls are normally more fun to buy for but I found many cute outfits, baby books, shoes, etc that I wanted to buy for my baby. My son is going to look so handsome in his new outfit! What did you buy for your baby when you found out the gender? I wanted to let you all know that I did respect my husband's wishes. He actually told me to post the pictures so I had the ok from him. 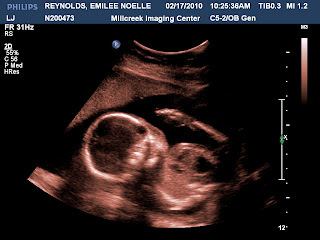 So, if you got confused about earlier posts, it should be made clear that Adrian was okay with me posting the ultrasound pictures. I think he changed his mind once he saw our beautiful baby. We are having a baby BOY! It was a very emotional morning for me. We both really wanted a girl but I can't imagine having a girl. It feels right to have a boy first. I am extremely happy. First, we met with our doctor, Camille Stevenson and were able to hear the heartbeat again. I love hearing my baby's heart beat. She said that our baby is very active. I started to think that maybe we were having a boy afterall. After our visit, we drove to the Millcreek Imaging Center in SLC and had an amazing experience. Wow! I was overcome with emotion before we even started. It was pretty ridiculous. I actually haven't been too emotional through my pregnancy but something about seeing my baby on the big screen brought me to tears. The technology that is available is remarkable. 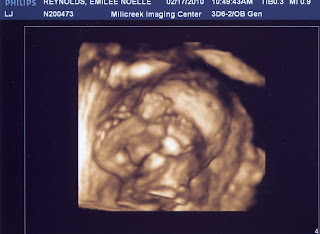 We were able to see our baby in 3D. Wow! That was pretty amazing! 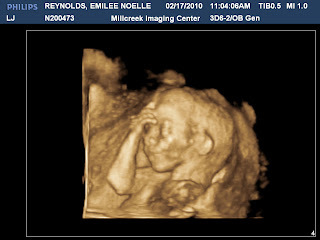 When the doctor told us that we were having a boy, I immediately felt love for our baby (By the way, I am crying as I'm typing this). 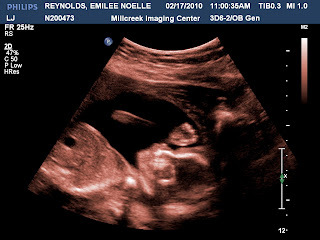 How can I not love the little miracle that is developing inside of me? He was pretty funny because he kept putting his arms in front of his face so we couldn't get a good picture but we finally did. 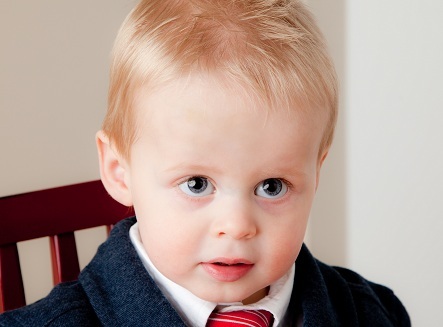 He looks just like Adrian. He is adorable. Here are a few pictures that were given to us. Hope you enjoy! 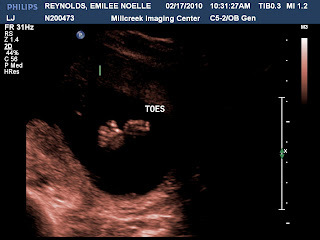 No, he does not have the "Roberts toe." This is probably one of my favorite pictures. I hope he doesn't have a headache like daddy. This is anothe one of my favorites! He was hiding his face with his arms for awhile. We couldn't get a clear picture of his cute face. Also, he may not like taking pictures or he may be playing peekaboo. Who knows? The big day is tomorrow. Adrian and I get to find out if we are having a boy or a girl. However, Adrian is a very private person so if you would like to know, give us a call or maybe the news will pass on quickly and you will find out. I am not a private person but I am respecting my husband's wishes. I am the opposite. I want to tell everyone I know. So, hopefully you will find out by us or a family member or a close friend. Otherwise, you won't know till the baby is born. We are both hoping for a girl so hopefully we won't be disappointed. I feel like it is going to be a girl but my hopes are really high so I'm scared to find out. I'm sure, I will be excited no matter what. If you would like to predict, leave me a comment and I'll be sure to include your name on my baby nomination list. Thanks! This Saturday February 20th from 12-6pm, my friend Emily and I are having a boutique. I would love to invite everyone that is in Utah to come and join us for this fun event. So, please come and show your support. We will have many products of our own to sell as well as other vendors. Here is our invitation. Come get a few new things for your home, family and/or yourself. We will provide a light refreshment. Please park in the spaces provided. There is no parking on the street. Knitted baby hats, knitted head wraps, Christmas stockings, hair clips, flower clips, notecards, art prints, carseat covers, sewing, Scentsy candles, butterfly cards, fabric, bookmarks, jewelry, glitter toes, children’s books, scrapbooking, designer jeans, and much much more! Well, I haven't been too good at exercising but I started walking with Emily Fuller. So, it is a start and I plan on continuing to either walk or try my step DVD. Now, I am onto February's goals. Also, I have changed my goals for 2010 since I am no longer in Young Woman's but mostly the goals are the same. 2010 has brought on a lot of fun and exciting changes. Second, I said goodbye to my wonderful Mia Maid class and received a new calling. I am now the RS Secretary in my ward. Yikes! Well, it has been wonderful so far and I am enjoying every minute of it. It is definitely taking over the spare time that I do have after work. But, that is what life is all about. It is the service that we do for others. It is definitely a job for Emilee. I'm sorry I don't have a picture of the RS presidency yet but I'll get one.